I mentioned to someone at church Sunday that I was going on vacation this week. "Oh, where are you going?" She asked. Yes. Again. Don't judge me. 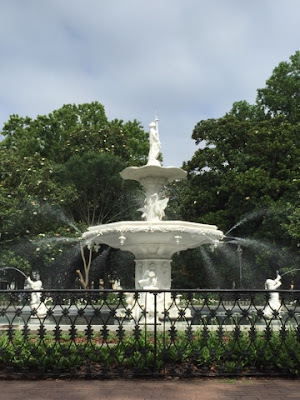 Several people have asked for recommendations, so I'm dusting off the blog to bring you How to Savannah on a Budget. I've been to Savannah close to a dozen times. Before, I've always driven. I can get here from Lexington in a little less than 8.5 hours (unless my mom is reading this, which in that case, it takes me about 9. I don't speed mom, really). This time we flew. Allegiant now has flights mon stop from Lexington, and we scored tickets for $100 each (round trip). This did include checking a bag, but between the two of us, we just checked 1. The weight limit is 40 pounds/checked bag. We didn't even hit 30 between the two of us, so why would you pay for 2 bags? Plus, you still get a "personal item" free (I used my 31 pool/beach bag; Crystal brought a backpack). Plenty of room, saves money, win/win. Obviously if you can fly for cheap, fly. 1.5 hours in the air > 8.5 in the car. The location was great, the last pic was the view just outside out front door, and yes, that's Forsyth Park. 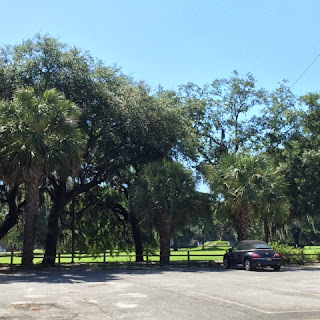 It was close enough that we could walk over and drink our coffee in the morning, and it was no more than a mile from anything in Savannah we wanted to do. The rates were cheaper than nearly any hotel we saw, and it was a nice place. Good towels, comfy sheets, and a full kitchen if we'd ever wanted to make dinner (which we did not, but you never know). Now obviously, in the past, I've always had a car in Savannah. This time, we decided to just see if we could make it without. Guess what-we could. 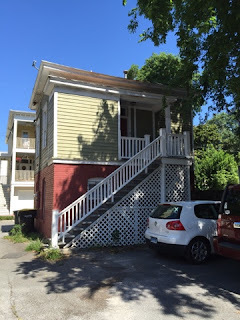 Now don't get me wrong, I'm not saying we didn't go far (one day I had over 25,000 steps) but we really didn't NEED a car because of the location of the AirBnB. I might be a nerd (let's face it, the "might" could for sure be taken out of that sentence), but I love the trolley tours. I've done several of them-the on and off Olde Time Trolley Tour, the on and off Old Savannah Tour, and the 90 minute Olgethorpe Tour that gives you on and off privileges afterwards. They're all good. I suggest choosing the one that is the cheapest that day. You're almost always better off buying online than in person. You can search Google for coupon codes for each (that's what I did this trip, found a coupon code for $10 off two tours, it said the tour had to be booked 24hours in advance, and we were booking approximately 10 minutes in advance, but I tried the code and it worked!). Also, set your Living Social or Groupon app to the Savannah/Hilton Head location a few weeks before you go and you'll probably catch an even better deal. Several companies also offer carriage ride tours and walking tours which I've never done, but are on my list to try another time. Many of the historic homes have tours as well. In addition to the history tours, as Savannah is supposed to be one of the most haunted towns, there are a plethora of Ghost Tours to choose from. I've done a couple in the past, but sadly I've never seen the ghosts others claim to see. Visit River Street and City Market (or as my mom collectively calls them "Market Street"). There are a bunch of stores and places to eat in this area. 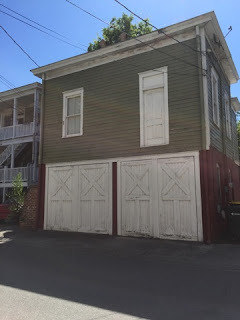 Stop in River Street Sweets or Savannah's Candy Kitchen (or both!) and get a warm praline sample. You can thank me later. Regardless if you're staying in the heart of it all or driving in from the outskirts, find a place to park downtown and just walk. There are over 20 "squares" (think teeny tiny parks) to sit and take in the nature, history & architecture, or drink a beer and people watch, you know, whatever tickles your fancy. There's also Forsyth Park which is a great place to sit and people watch, especially by the fountain. My personal favorite thing to do is to offer to take pictures for strangers so their whole family can be in one shot. I'm nice like that. As I said before, there are lots of places on River Street to shop. One of my favorites is Savannah Bee Honey. They have a bunch of local honey that you can sample, as well as other honey products (soap, lotions, chap stick, etc.) it's definitely tell worth a stop. Another favorite is the ShopSCAD store. This is items created by local college (Savannah College of Art and Design) students, and there's some cool stuff in there. Now, I've never actually purchased anything because it's pretty expensive, but it's cool to look at. There are also Tanger Outlets close to the airport. So if your flight is cancelled and you have to stay another night, ask of your hotel will shuttle you there. The Country Inn & Suites will. Trust me, I know. Also, did you know Gap Outlet will ship your purchases home for only $5? I have utilized this on a previous trip and when I came home to a huge box it was like Christmas! 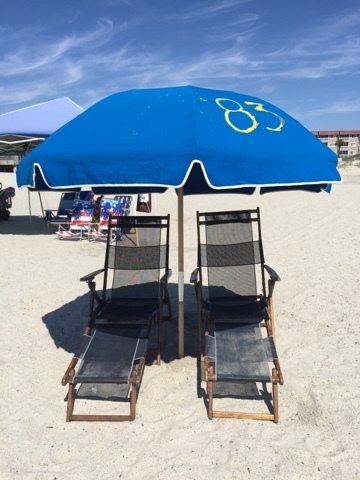 If you're a beach person, hop in the car or use our Uber tip and head to Tybee. It's about 25 min outside of Savannah, and is a great beach. In the spring and fall, the beach is NOT crowded. In the summer, obviously a bit more so. Just by the Pavilion/Pier you can rent two beach chairs and an umbrella for $25 until 4:30. Worth it, even if you didn't save $30 getting there and back. 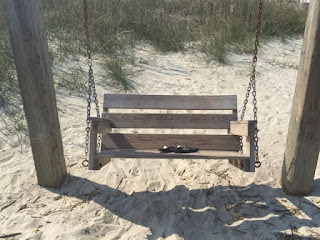 There are also porch swings throughout the beach area. They make my heart happy. 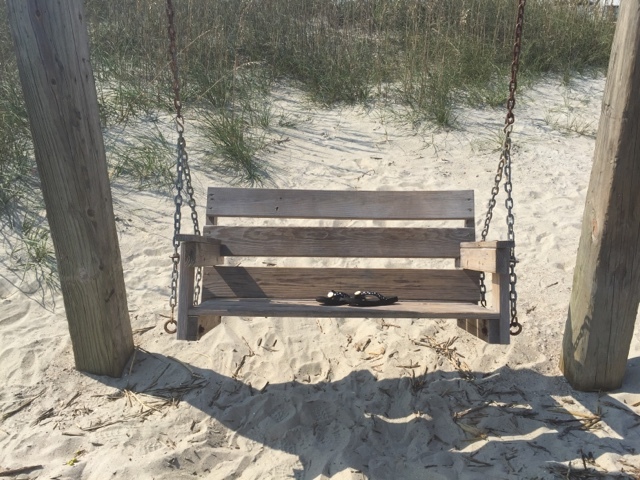 The beach AND a porch swing? Well that's the south at its finest. Now we get to the good stuff. Food. Drinks. Sweets. Savannah is full of places to eat whatever you're in the mood for. Again, check Groupon/Living Social for deals before your trip. (In the past I've even gotten buy one/get one deals.) When I'm close to the water, I eat seafood. If you're not a seafood fan, you might want to ask someone else for tips. River Street is full of restaurants. What's nice is that they all have menus posted outside, so you know before you head in in you want to eat there. I always like to have a "go to" that I KNOW I love. It used to be Uncle Bubba's Shrimp and Grits, but then sadly, that restaurant closed (RIP). Luckily, a stop this week at The Cotton Exchange and an order of Cajun Tortellini has helped right all the wrongs in the world. It was legitimately one of the best things I've ever eaten in my life. Cheese tortellini, seared scallops and shrimp, and a creamy Cajun sauce. Oh. My. Deliciousness. Now I'm not saying this is heath food, but I told you I walked 25,000 steps one day, so lay off me. (Disclaimer: no picture. We were too hungry.) We also ordered the crab cake appetizer which was delicious. Another great choice is the fried fish sandwich at River House Seafood. So fresh and perfectly lightly fried. I got it with the Sirachia sauce instead of tarter. Yum! We happened on a couple of places that seemed to be full of locals as well (always a good sign) on special nights. Crystal Beer Parlor was having a pint night, and purchase of a certain beer yielded a free pint glass. Also Treylor Park on Bay Street has Taco Tuesday-free draft beer with the purchase of any tacos (I recommend the Fried Grouper-it was the catch of the day). Both restaurants have specials listed on their Facebook pages. I'm sure locals will tell you there's more than two choices, but I think all you need are these two: The Lady and Son's and The Wilkes' House. Both offer buffets of fried chicken, mashed potatoes, Mac and cheese, and other southern staples. Lady and Son's (Paula Deen's restaurant) also has a menu you can order from, but I prefer the buffet (honestly the best mashed potatoes ever in the history of the earth). You can request a table online and show up when it's time to eat. You can also just walk in and get a to go container and eat lunch in one of the close by squares (I've never actually done this, but I did email them to make sure that was a real thing and they told me in fact it is). At Wilkes, you'll be waiting in line a while (about 45 min for us), and it's family style, so you'll be seated with a bunch of strangers (they say you can make friends this way, but my table was too busy stuffing our mouths to meet and greet). Wilkes has the BEST fried chicken. I think you can't go wrong either way. As mentioned before, a good tiny bite of dessert is the free praline sample at one of the candy shops. If you're in the mood for more, you can always buy a whole praline, or any assortment of fudge, truffles, or chocolate covered anything. In City Market, there's a cookie shop called Byrd's. They make tiny shortbread cookies in dozens of flavors that are all scrumptious. They offer free samples (and you can sample several) as well as a free small bag of their featured flavor if you sign up for their email list while you're there. 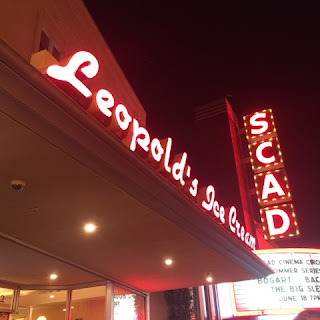 If you're in the market for a cool treat (and don't mind waiting in line), Leopold's is the place to go. You might be in line for 30 minutes, but honestly. It's worth it. Best ice cream I've ever had. At Jen & Friends, there are over 300 martinis you can choose from. Yes. I said 300. Honestly, I could've put this under desserts, as the ones we got (Reese Cup and Rice Krispie Treat) were much more dessert like. At $9 a pop you won't want to have many, but honestly, you need to have one. So there you have it... the best things to do and see in one of my favorite places. Now, if you will excuse me, I am off to find Cajun Tortellini recipes.